With a fan base as huge as the brush itself, Diorshow has established itself as a solid performer in the lash department. People either love it or hate it because of the huge, traditional bristle-style brush applicator, but it's the formula combined with that brush that makes this mascara worthy of cult status. It truly performs. There is really nothing else like it out in mascara-world right now. Diorshow The Original, I'll call it, is a dry-ish, thick formula that works really well to build volume and length on my stubby, sparse lashes. And it does the job quickly. I am so lash-challenged that I will not pass up the opportunity to buy and try every new mascara that I see, department store or drugstore. So of course when Diorshow was launched, I caved. I was thrilled to see lashes, long and thick lashes, with a minimal amount of time and effort. The brush catches all my lashes, and the dry formula grabs without clumping or flaking. Somehow Dior has managed to make a formula that is buildable, workable, and effective. I can go back and forth from eye to eye and continue layering quickly. Work time is good, despite the dry formula. When the mascara dries on the lashes, it leaves them soft, no crispies! Dior now offers a few alternative versions of the original formula. Blackout is a wetter formula that is supposed to be blacker. I think it just appears blacker because it is wetter. People who didn't care for the dry original might like the Blackout. And then there is Unlimited, which was designed to be used in conjunction with the original. This is the lengthening formula. You can use this one first, and then use the Diorshow on top of it. Be warned, this gives an over-the-top false lash look that is fabulous and lush, but better suited for evening looks. The white tube in the photo is something I found on ebay. It was listed as a mascara primer, and what's inside the tube is white, thick and goopy, and has the huge Diorshow brush. I've never seen it at a counter in the USA, although my seller listed a California address. Well, I caved because I'm masc-curious. I can't say that it enhanced the effects of any of the Diorshow formulas, but they are so good on their own on me, that maybe the primer product wasn't even necessary. If any Blogdorf readers know of this Diorshow primer, please let us know in the comments. And please also let me know if it's just some weird counterfeit product. I won't mind. Disclosure: The product featured in this review was purchased by the reviewer, Cavewoman. I LOVE the Diorshow Blackout but it has a habit of giving me transfer marks on upper brow brown, which the original never does. Even using the Estee Lauder mascara primer doesn't prevent this, any suggestions? I love Diorshow. I does everything I want it to and more, plus it frees me from my eyelash curler. Love it, one of my true HG items! Love the original Diorshow- I'll definitely consider trying the "Blackout"! this didn't do much for me so i'm sticking to my l'oreal voluminous. I tried DiorShow for the very 1st time this weekend...and I've been wearing it since. I love it for the big,fat lashes it gives me - great review! It was my first mascara when I was twelve (expensive young girl, I know) and I loved it (: unfortunately it's since been thrown out. i really, really loved it, and this review definitely makes me want to try it again. I'm pretty sure I've seen the white tube here in Canada... I'll check again for you. I really like Diorshow (the formula) BUT I hate the size of the brush! it is TOO big I think. I love love love Diorshow Blackout! I am a big mascara junkie and I cannot live with out this mascara. I have found that layering is the best for the big false eyelash look. I use Shiseido's base mascara first on my lashes. Then I layer it with Diorshow Black out. The final coat, I use Imju FiberWig Mascara. All my friends rave about how thick and long my lashes look. I have however found a similar drugstore mascara that kind of resembles Diorshow's mascara, L'oreal Voluminous. Still nothing is better that the real thing! How does this mascara compare to Yves Saint Laurent "MASCARA VOLUME EFFET FAUX CILS"? It's my favourite makeup. 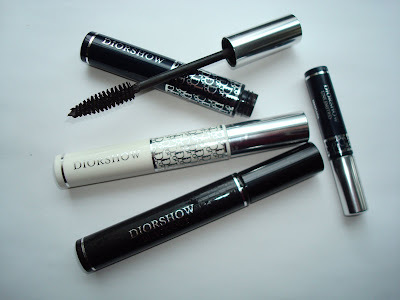 I tried layering the mascaras today-first the blackout and then the Diorshow, and I LOVE LOVE LOVE it! This is my new go to look! The Diorshow White Tube Mascara was an exclusive first launch product. It came out when Diorshow first came out and was a one time shot product and it is not a primer. It is a white color mascara so you can have white eyelashes or a cool thing to do is to do your black mascara and put the white color just on the tips of your mascara. It was sold at all Dior Counters in the United States when Diorshow first launched. 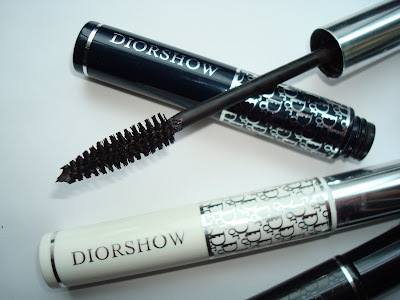 Actually did you know that Diorshow Mascara was suppose to be limited edition item to Dior cosmetics but it did so well the decided to keep it. What makes Diorshow so great is the big brusha and the idea came from the fashion shows. The make up artist at the fashion shows acutally cut open tubes of mascaras and were applying them with giant tooth brushes to create that full,big dramatic eyelash look. Hope this helps to all.